Cheers - it's Friday! I'd like to share a few things here: first, this fun blue and gold bracelet from INPINK (save 30% with code DAPPER30); second, these pretty teal patent Miu Miu heels I found on sale at a consignment shop recently; and third are these pretty white earrings from Jeweliq. And of course, Bandit is showing off his modeling poses, too. Have a wonderful weekend! Bandit is so adorable! Also, love your necklace! Love those gorgeous heels! Bandit is such a cute little model. Have a great weekend, Mary Ann! you so pretty! love the entire outfit, and hope you have a great weekend! xO! Gorgeous jewels! I love that necklace! And I love your sweet bunny! Both of you look adorable! Love those shoes! Bandit is so cute! Love this necklace! LUCKY YOU to have found Miu Miu like that... super jealous. They are so cute! So adorable, both you and the bunny! Oh, and you look OK, too....lol just kidding!!! I love the top and your pops of blue! Very chic and comfy looking outfit. How cute are you?! And with the adorable bunny! 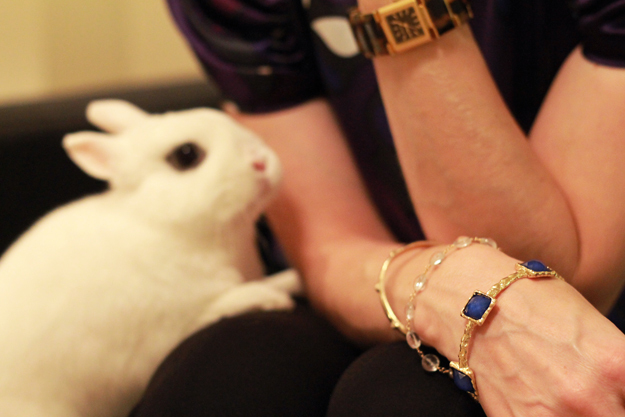 Love the jewelry and your bunny is so cute! yay! Happy friday! Love bandit standing up like this to try to get closer to you! so cute. My favorite piece on this outfit is the cobalt blue bracelet. Love the hammered look if it. GREAT outfit! LOVE all the details. The purse is FAB! 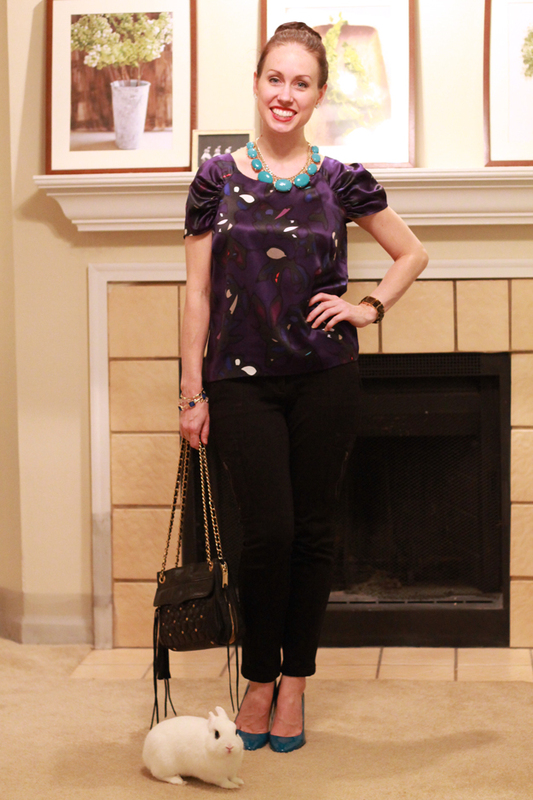 This blouse is so pretty...I love jewel tones! And the satin is really dressy. Ah, Mary An...you look lovely...but those MiuMiu heels...oh! heart be still! I invite you to follow me back , hopefully via bloglovin! awww... Bandit is sooo cute!! Loving all the jewels.. and those heels..aahh!! Everything is fabulous...especially the color combination and the necklace but it's obvious that Bandit is the real star of this post...could he be any more adorable?!!! I want a bunny so badly! That post is soooo cute! Lovely! I followed you, I hope you'll follow back! Love your look and the chic touch you've added with your heels and necklace! !